NEW! See how easy it is to learn your Car theory by watching videos. Watch a video and then take a practice test here. New! Increase your chances of passing the DVSA Car driving theory test 1st time by watching videos. Learn everything you need to know to pass the DVSA Car driving theory test just by watching our unique, fun, animated tutorial videos. Available across all of your devices for just £14.99. Animated video tutorials will get you ready to pass the Car driving theory test in the fastest time possible. You’ll not find these videos anywhere else. You can make as much use of your account until you PASS – no matter how long you need it! Watch a driving theory training tutorial video and then take a practice theory test to see how easy it is to learn the Car theory with videos. Car driving theory training made simple. There’s a completely new and different way to prepare for your theory test. It’s called video. There isn’t anything new about video or learning using videos for that matter. But what is new is practicing for your Car driving theory test using videos. This proven learning technique is an entirely new and unique approach to revising for the DVSA Car driving theory test. The theory test training videos will take you on a journey with our friends from the Stick family. 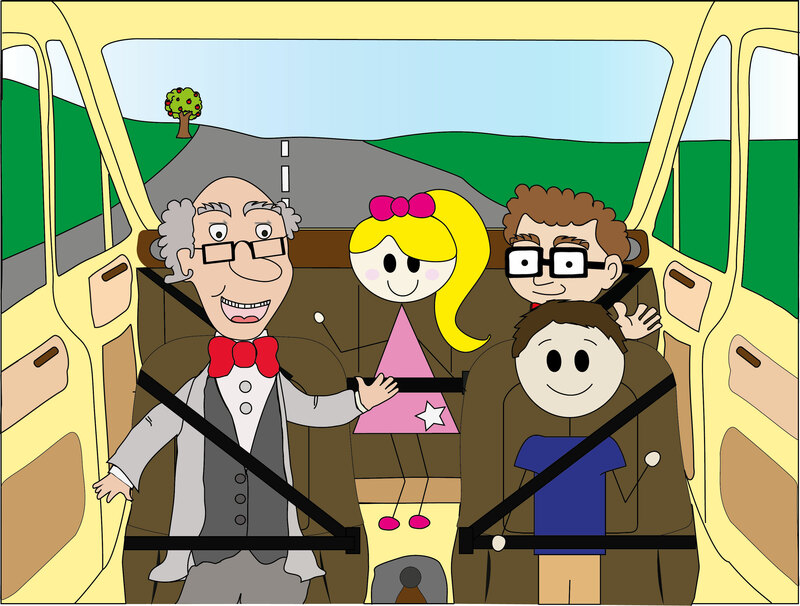 With a little help from them and our very own Professor Theory, they’ll teach you what you need to know to pass the Car driving theory test. Who needs our Car driving theory test practice material? Want to PASS 1st time? It’s essential that you learn with the latest revision questions, answers, explanations and CGI hazard perception videos because they give you the best chance of passing your Car driving theory test. The good news for you is that Driving Theory 4 All gives you all of the latest revision questions, answers, explanations and hazard perception videos, along with much, much more. This is because we’re a Crown Copyright holder with the DVSA (the people who set the tests). And we don’t stop there. You’ll have the chance to explore our comprehensive, easy-to-follow, and all-new driving theory test videos for the Car driving theory test. You’ll not get these cutting-edge videos anywhere else. If you want Car driving theory test practice material that gives you everything you need to pass, unlimited Car mock theory tests, advanced learning features, and that helps you learn quickly, then our Car driving theory test practice package is ideal for you. Prices start from £14.99. It’s essential that you practice with the latest revision questions, answers, explanations and hazard perception test videos, licensed by DVSA (the people who set the Car theory test), because they give you the best chance of passing your Car driving theory test. The good news for you is that Driving Theory 4 All gives you the latest revision questions, answers, explanations and hazard perception videos, along with much, much more. This is because we’re a Crown Copyright holder with the DVSA (the people who set the tests). Say “hello” to the stars of our videos. Learn with the latest revision questions, answers, explanations and hazard perception videos, licensed by DVSA (the people who set the Car driving theory test). This includes the latest CGI hazard perception videos. Revise for the Car driving theory test using our short, simple, and fun videos. There are a number of short videos for you to sink your teeth into covering everyday scenarios. Take your Car driving theory test revision anywhere with our iOS and Android theory test apps. And the best part is you can use them offline absolutely anywhere. You’ll experience high-quality, fast, and professional support from our friendly team. And best of all, our support is free forever. Introducing benefits that speak for themselves. Driving Theory 4 All is transforming how Car learner drivers practice for their theory test by introducing an engaging and innovative style of learning through videos. Our practice theory tests look and act just like the real DVSA theory test. This is great news for you because it means there will be no nasty surprises on the day of your theory test. Everyone is different and because of this people learn differently. We’ve lots of advanced learning features, like English voiceover, picture based learning, and videos for Car learners. You’ll get full access to our iOS and Android Car driving theory test apps. And what’s great is that you don’t need WiFi, 3G or 4G to use them, so you can practice wherever you are and when you’re back online your scores can be synced with your other devices. Our Car driving theory test practice packages come with a 100% Money Back Guarantee as standard. This means that we’ll refund the cost of your practice package should you fail your real Car driving theory test after meeting our terms. Try our Car driving theory test practice material for 24 hours and if you’re not 100% happy, you can get a full refund of your Car practice package. Whilst we don’t think this will be the case, we want to make sure you’re completely happy. Discover the new way to revise for your Car driving theory test. Driving Theory 4 All’s shiny new theory test videos are great for preparing for the real DVSA test. Each video is comprehensive yet simple and easy to understand. Throughout each video you’ll meet the Stick family and you’ll learn just how important driving theory is in many everyday situations. The videos will help you prepare for the test by playing out realistic everyday scenarios you’ll relate to. They’re also animated too using the latest technology. This means every video is ultramodern and uses the most up-to-the-minute theory test material. Which Stick family member are you most like? To find out which Stick family member you’re most like, start watching a sample Car theory tutorial video. 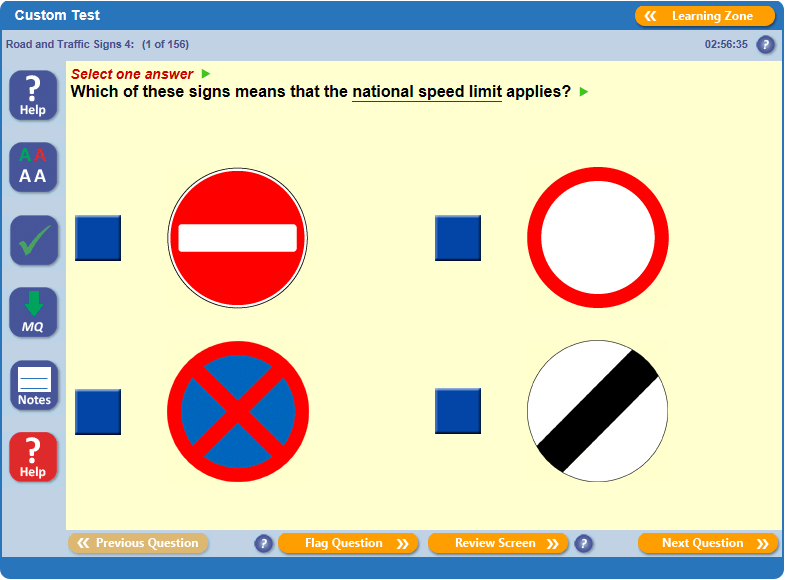 Practice tests are an extremely interactive way to revise for your Car driving theory test. You’ll find that our practice tests are broken down in to small, easy to manage tests that put you in control. You can choose to use our unique learning features during any practice test. And if you didn’t already know, they only contain the latest driving theory test revision questions, licensed by DVSA (the people who set the Car driving theory test). Once you’ve mastered the practice tests, it’s time for a Car mock theory test. You can take as many mock theory tests as you need and they’re even available on our iOS and Android apps. A Car mock theory test is just like the real DVSA test, you’ll be given 50 questions and have 57 minutes to answer them. Unlike our practice tests, Professor Theory won’t be there to help you, so when taking a mock test you’ll be tested on what you’ve learnt. No problem. Let our Theory Test Master build you a practice theory test based on how you’re progressing. The Theory Test Master (with a little help from Professor Theory!) is so sophisticated it knows you better than you know yourself. All you need to do is choose how many questions you want to see and boom, you’ll have a Car practice theory test personalised for you. By letting the Theory Test Master do the hard work for you, it ensures you’re being tested on the theory test questions you haven’t previously seen or the theory test questions you’re struggling with. If you’re a visual learner you’ll love our picture based learning. This is perfect for anyone that likes to learn using pictures. Text explanations are a great place to start studying because they give you lots of relevant Car theory information. Because of this, text explanations are a fantastic tool for reinforcing what you’ve learnt during the practice tests. During practice tests you can make full use of 50/50 options, our glossary for difficult words, and instant feedback for every theory test question. You’ll even have the chance to add your own notes, listen to English voiceover and mark theory test questions you’re struggling with for later review. A seamless experience from online learning zone to our iOS and Android apps. We know how difficult it can be to find time to revise for the Car driving theory test, especially when you’ve got other distractions at school, college, uni, or work. This is why we’ve made it incredibly easy for you to revise on the go with our Car driving theory test apps for iOS and Android devices. You’ll get our companion Car driving theory test apps included when you sign up for our Car driving theory test practice package. With Driving Theory 4 All’s Car driving theory test apps, you can literally prepare for your theory test, including your hazard perception test, anywhere. And because you don’t need WiFi, 3G or 4G, you can use them offline. Perfect for when you’re travelling home by bus or train. What you’ll get with our Car driving theory test practice package. You’ll get the latest revision questions, answers, explanations and hazard perception videos, licensed by DVSA (the people who set the Car driving theory test). There’s also lots more videos for you to practice with. Videos are perfect for finding out information and learning something. This is why they’re such a powerful learning tool when revising for your Car driving theory test. Our picture based learning, explanations for difficult words, English voiceovers, My Questions and My Notes really do help you revise for the real Car driving theory test. Driving Theory 4 All’s companion Car driving theory test apps allow you to revise offline from anywhere. This means you’ll always be able to practice. Available for iOS and Android devices. Top tips on how to pass your Car driving theory test. You get instant access to your Driving Theory 4 All Car driving theory test practice package. There’s no waiting around for deliveries. This means you don’t lose any time and can get started straight away. As soon as you’re logged in, you can start to have a play with the features. This is the best way to find out what works for you. You can choose from animated tutorial videos, pictorials, text explanations and practice tests. Don’t let your busy social life get in the way of your theory test revision. With Driving Theory 4 All Car theory test apps, it’s easy to squeeze in some revision – even if it’s just for a few minutes. Driving Theory 4 All Car practice theory tests will get you used to the types of questions you’ll be asked in the real test. Practice tests are a fantastic way to get up to speed quickly, especially with our intelligent testing system. This will allow you to choose to take a test on questions you haven’t yet answered or on questions you’ve previously answered incorrectly. If you’re progressing nicely, you may want to take a Car mock theory test. Your score will give you an indication of how well you’re doing. You can take as many Car mock theory tests as you need. Don’t forget the hazard perception test. You’re spoilt for choice with the number of hazard perception clips you can practice with, including the latest DVSA CGI videos. You can start to feel confident when you’re scoring at least 80% in each of the clips. You shouldn’t leave anything to chance on the day of your Car driving theory test. Check that you know where your provisional photo card driving licence is, in good time before the day of your theory test, just in case you’ve lost it and need to order a replacement. Also, make sure you arrive at the test centre with your provisional driving licence at least 15 minutes early, to allow time to be signed in. Taking any test can be daunting, even if you know the answers. It’s understandable to be nervous but treat the real theory test as an opportunity to show off what you know. Make sure you read every question and flag any questions you’re not sure of. Things you need to know about the Car driving theory test. The UK Car driving theory test is split into two parts – a multiple choice questions test and a hazard perception test. In order to pass your Car driving theory test you will need to pass both parts. At the end of the theory test you’ll receive your results in a letter from a member of the theory test centre staff. The letter will tell you whether you’ve passed or failed the theory test. Once you have passed, you’ll be able to book your practical Car driving test. You have 2 years from the date of passing your Car driving theory test to pass your practical Car driving test. If you fail to pass your practical test in this time you’ll need to retake your theory test. You can book your Car driving theory test with the DVSA on the GOV.UK website for £23.00. 1. Why do you need to take the Car driving theory test? If you want to drive a Car in the UK the Car driving theory test is the first part you need to pass on the pathway to achieving a full UK driving licence. After you have passed your Car driving theory test you can take the Car practical driving test. 2. What’s the Car driving theory test pass mark? When taking the Car driving theory test, you’ll need to answer 50 multiple choice questions and score 43 or more correctly to pass this part of the theory test. You’ll get a total of 57 minutes to complete this part of the test. You’ll then be tested on 14 hazard perception test videos. The Car hazard perception test is marked out of 75 and you need to score at least 44 to pass this part of the theory test. 3. How does the hazard perception test work? 13 hazard perception test clips will contain 1 developing hazard and in 1 clip there will be 2 developing hazards. The maximum score for a developing hazard is 5 points.